There's something about the crispness in the air in Seattle that seems to make colours seem more vibrant. We were so lucky to have gorgeous blue skies and mild weather for our second pit-stop in Seattle, this time to spend a few days with my sister and parents who happened to be visiting at the same time. It's been non-stop family reunions for the past two weeks - how lucky! We made the most of the clear skies with a trip to the Seattle Space Needle - a great way to get perspective on the city and fun for the kids too. It's right next door to the beautiful EMP Museum (which everyone raves about) - must put that on the to-do list next time. We also split up one day - the boys headed to the Boeing Factory for a tour and then a craft beer brewery, while we frocked up for high tea at the Queen Mary tea room. It was so cute-kitsch with floor-to-ceiling florals, corgis, sweet treats and beautiful tea cups. Never mind breaking one - the shards are embedded in fun mosaics on the footpath. (by the way, everyone in there was dressed up, and I'm talking hats, gloves and tiaras; those crazy Yanks!). And that concludes my mini-tour of our family holiday; back to the real world and cooler temps in Sydney. 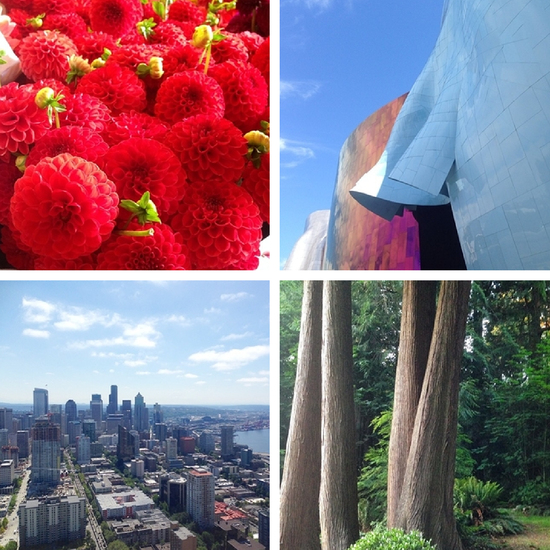 Let me know if you have any great Seattle travel tips - we'll be back!